Coming back from Busan on the train with Elizabeth last week, we started waxing nostalgic. I asked her what she was going to miss most about Korea, and most looking forward to in America, and then she asked the same of me. It was strange….both of us are really excited about returning to America, and yet with both of us, our lists of what we like in Korea are far longer than what we miss from America. But I digress…. Also, does “take a rest” sound strange to you people who have been in America this past year? I remember thinking that it sounded strange when I first came here, but now I can’t for the life of me think of what a native English speaker would say in that situation. Maybe “take a nap,” or just “go rest”? **sigh** I have no idea. I’m told, however, that this loss of one’s native tongue is a common side effect for teachers of other languages, so I take some comfort – albeit small – in that fact. I’m sure my language lessons with Si-yeon don’t help. Si-yeon and I have really kicked up the Spanish / Korean studying this past semester. We meet every week twice a week for 2 hours, and do other homework and studying on our own during the week. It’s been really helpful, and my Korean has improved by leaps and bounds. But please, let me just explain to you really quickly what our study sessions consist of, so you understand why I’m so linguistically confused these days. First, we correct each other’s writing – we both write at least one story in whichever language we are studying during the week, before class. Then, we start on the flashcards. I make flashcards written in Korean and English, and she writes hers in Spanish and English. So I take her flashcards, and choose a Spanish word and make a sentence in Korean with it. Si-yeon then has to say the same sentence in Spanish. She then does the same thing in reverse with my flashcards, making a sentence in Spanish with my Korean flashcards, which I then have to translate into Korean. (are you still with me? ;]) After that, we do guided dialogue. We both have textbooks with practice dialogues in them. So she takes my textbook, reads the Korean sentences, translates them in to Spanish, and then I say them back to her in Korean. Then I do the reverse with her textbook. After that we have a period of open dialog on a topic that one or both of us is studying at that time, first all in Spanish, and then all in Korean. The people in my life…. I love my life. I love it. And no, I’m not saying that everything is always wonderful and perfect. But I am saying that God is faithful, and I am starting to actually feel at home here. This week I’ve been able to hang out with a lot of previously un-hung-out with people, and it was wonderful. I still barely speak to my host family, but I’m finally starting to find my niches and be accepted in other circles, and it’s a great feeling. Anyway, last Saturday I went to the Gyeongju National Museum with some friends. It was myself, another foreign teacher in Gyeongju, Harry, the other Fulbright teacher in Gyeongju (Elizabeth), and Art, a Fulbrighter living in Pohang, about 20 minutes away. Art was the 1st Fulbrighter I’d seen other than Elizabeth since departure day, and it was lovely to see him. So we went to the museum (Gyeongju has enough culture in it to last a lifetime of sightseeing!! ), and then went for lunch. We went to a little out-of-the-way Italian restaurant, and I got….lasagna!!! I had been craving it for weeks, but had been told that there was nowhere in Gyeongju to get it. I was in heaven :D.
Sunday I went to church again (it was so good to be back after having missed it the week before because of Chuseok! ), and then when out to lunch after with some guys from church. I actually ended up singing on the worship team during the service. I don’t even like my voice on a normal day, and I was still sick anyway (I’ve had a nasty cough for several weeks now), but I wanted to serve in the church, and that was what they needed, and so I found myself up on the stage. Regardless of my nerves, though, it wasn’t too bad, and I’m looking forward to being back up there next weekend. After dinner, the sun had set, and so we went to Anapji pond. Anapji is (another!) famous landmark in Gyeongju. It used to be part of the palace complex during the Shilla dynasty, when Gyeongju was the capital of Korea. It’s absolutely breathtaking at night. Check out the pictures below…. Thursday was dance night again. I decided to hang out with Jennifer again, but this time we didn’t skip the dance. We went out to dinner first – and met some new friends while there. That seems to happen a lot in this town – you’re just more outgoing and friendly, and make friends with anyone who look like they’ll talk to you. In this case, it was 2 guys – Jennifer had already met one of them, so we sat down with them and had dinner together. The dance was lovely, as usual. It’s fun, but every time I dance salsa it reminds me how much I miss West Coast Swing :(. Oh well, WCS will still be waiting for me when I come home… In the meantime, I’m trying to make the best of things and just improve my latin dancing while I have the chance. 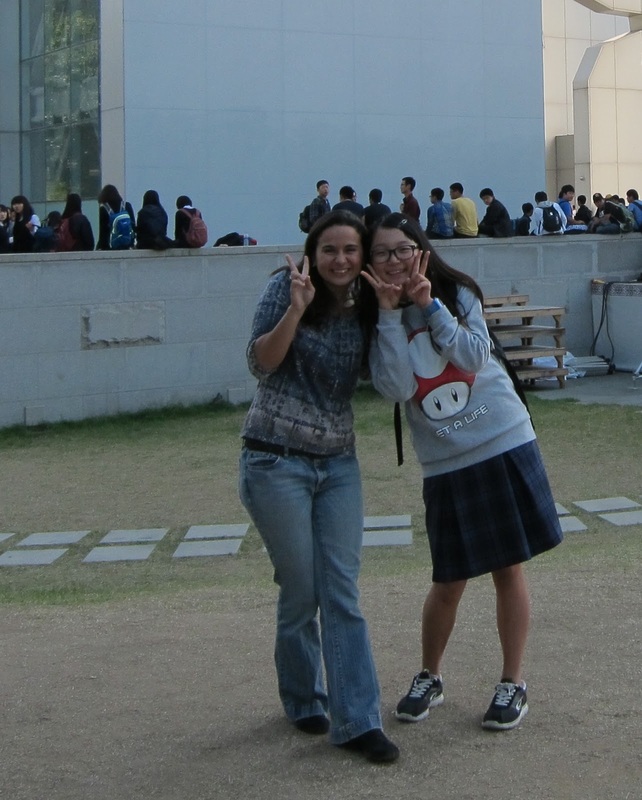 Oh, I also got 2 more requests from Koreans to be my boyfriend at the dance….my grand total is racking up, lol. On Friday, I went to the Expo…again. This time it was a school field trip. I didn’t really do anything particularly new this time – saw a couple of different shows, bought a dress made in India (I’m an XL in Korean sizes…can you believe it?? ), had lunch there – but the best part about this trip (aside from the exquisite weather) was the people I was with. I hung out with a bunch of co-teachers and students the whole day….and it was so.much.fun. I adore my school and everyone in it :). An old teacher at school. She always calls me 예쁘다 (beautiful). That’s the extent of our conversations. She just grabbed me here and insisted on a picture…. Friday evening, the fun continued! Through a bizarre and I would say God-sent series of coincidences, I heard about a Korean woman who’s wanting to learn Spanish. She’s married to a westerner, so she speaks fluent English, and she’s really motivated to learn Spanish, but hasn’t been able to find any opportunities to learn here in Gyeongju. So we met up for coffee, and worked out a time when we can get together and do a language exchange – I teach her Spanish, she teaches me Korean. She was sooo motivated, I think it’s going to be a really good fire under me to get me learning. Plus, I’ll get to practice my Spanish. I’m super excited :). After that, I went to an open mic / poetry night. It’s the first one I’ve ever been to, and I really enjoyed it. I loved seeing into other people’s hearts…it was really intriguing. Besides which, the poems / songs / speeches / etc were all really well done. I think I’m going to try to prepare something for the next one…. Oh, I forgot to mention that I also went to the Museum of Flamenco Dance on Friday with the people from my dance class. It’s a private museum, created by a super famous Flamenco dancer, but it’s also one of the best museums I’ve ever been to. It’s full of interactive rooms, and clips of different dancing styles, costumes, pictures, and more. It was quite an interesting trip. After the museum we made our way to a little store that the professor knew that sold the cool shawls that they sometimes use when dancing Flamenco. I’m sure I will never be able to use it in real life, but I splurged and bought a shawl, anyway. It’s white, all lace, and lovely. Saturday I made my way to the Seville city cemetery, per Jon’s homework. Goodness, the comments I got from people at school when I mentioned that I wanted to go to the cemetery!!! I’m pretty sure that half of school is now convinced that I’m an emo kid in hiding, lol… But, all morbidness aside, el Cementerio de San Fernardo is really quite a lovely place. It is huge, and unlike any cemetery I’ve ever seen. There are sweeping pathways with meticulously manicured plant and floral decorations, enormous ornate sepulchers that house whole families, statues dedicated to famous personalities such as toreros or flamenco dancers, and thousands of the more “normal” tombstones. Sevillanos are not only buried under the ground here – all around the outskirts of the cemetery, there is a network of above ground catacombs, with separate crypts for each individual coffin and an inscription etched into the stone on the front of it. In the center of the cemetery, there is a statue of El Cristo de las Mieles – legend has it that . Además, a few days ago was the Festival de Todos los Santos, when everyone goes to the cemetery and cleans the graves and puts flowers or trinkets on them. All of the decorations were still there, and it was incredible beautiful and peaceful. I really wanted to take pictures, but I figured that would have been sacrilegious or something – at the very least inconsiderate to the hundreds of other people who were there. I had been planning on going by myself, but I mentioned my plans to Justo and he would have none of that. San Fernardo Cemetery is pretty far away from where I live, and it would have been rather complicated to get there – I would have either had to take 2 buses, or walk about an hour to get to the second bus stop. So Justo offered to go with me, and we went in his car. Afterwards we went to a supermarket and got some food to make a picnic lunch, which we then took to a nearby park. Again, I must extol Justo’s awesomeness. He had told me before he picked me up to bring my research paper that I wrote for one of my classes – while we were at the park, he sat down and read the whole thing, correcting my mistakes and explaining to me why they were wrong. He’s a very good teacher. My señora absolutely loves him – he is mature, has a steady job, speaks three languages, doesn’t party late at night, and is the best intercambio (in her opinion) that any of her students have ever had. I give her lots of props that she hasn’t suggested that I date him yet, lol :). Anyway, that’s about all of the excitement that I have to report for now. Sunday morning I went to church, and I spent the entire afternoon working on my second research paper. It’s not due until December, but I don’t have time to work on it during the week, and I’ll be traveling the last 2 weekends in November, so I want to go ahead and get it done. Can you believe that I only have 5 weeks left in Seville??? And three of those weekends I won’t even be in Seville – I’m going to Grenada to see La Alhambra, then Paris for 5 days for Thanksgiving, and then Morocco in December. It’s absolutely insane how fast time is going. I was trying to decide what I would miss most about Seville. It’s hard to choose. My church and church friends come to mind quickly, but so do my Spanish friends, such as Justo, and my host family, and the food, and culture, and dance, and architecture…I suppose I’ll have to wait and make that decision closer to my departure date :). Well, it’s off to bed for now for me…my brain hurts from reading and writing about the Restoration of the Spanish Monarchy all day. Sending all my love, as always!! We had a 4-day weekend this week. While most of the students were off exploring exotic places such as Italy, France, or Morocco, I elected to stay here. Honestly, the only reason I stayed was because I didn’t have time to make plans to go somewhere. But I’ve very glad I did. It turned out to be quite a productive, eventful weekend, albeit rather quiet when I was home – my host family was at the beach all weekend. Check out the note they left me – I thought it was really sweet :). Thursday night there was a Halloween party hosted by the school. I went, and even half-heartedly dressed up! (I wore a masquerade mask I bought in Barcelona) I’ve never really seen the point of Halloween, and don’t ever celebrate it in the USA. I find it ironic that one of the only time I actually celebrate Halloween is in a country which does not celebrate it as a whole :). Anyway, the party was pretty lame, but I got some interesting pictures. Myself and a friend, Allyx, started dancing Flamenco in the middle of the party. That was interesting, lol. After the party everyone went out for tapas. That was more interesting, in my opinion. I got to talk to the Academic Director for a while – she apparently is a Harvard graduate!! I was very impressed. Anyway, I finally made it back to my house around 1:30 in the morning. Although I didn’t have school the next day, I was waiting there when they opened at 8:00. Friday was my push day. I wanted to get a ton of homework done so I wouldn’t have to worry about it for the rest of the weekend. I took a break for lunch to eat with Jess and Paola, 2 girls from the Bible study. They also brought a Spanish friend of theirs, Julia, who is really sweet. It was very encouraging to be able to spend some time with godly, wholesome, fun girls. Other than lunch, though, I was at school until it closed – at 8:00 at night. Almost 12 hours total :/. I’m so glad I did that, though – I finished one of two research papers, did all my homework for Tuesday and half of the stuff for Wednesday, and also studied for 1 of my 2 tests that I have time coming week. I felt very accomplished and on top of things :). I often get teased for being such a studious student, but I really think that I’m the one with the last laugh – I’m never stressed about getting things done, and I go out just as often as anyone else. It’s an excellent combination :). Around midnight, we cranked the music up and started dancing. There were lots of great dancers there – ironically enough, none of them were Spaniards. They were from Columbia, or Cuba, or Peru, etc…so we danced some Merengue, some Salsa, Bachata, a little bit of Swing…the whole shebang. Then we tried to learn the Thriller dance. We didn’t learn it – but watching people try to watch it was quite amusing :D. The party finally ended around 1:30 because half of the group had to leave to catch the last metro home at 2:00. I was very sad to go :(. I haven’t had that much good, clean fun in a long time. Check out the pictures from both parties here – they should be at the very end of the album. Saturday morning I had planned on going to Isla Magica, a theme park in Seville. But Saturday morning dawned cold and rainy and windy, so I scratched that idea. Instead, I went back to Nadine’s house and hung out with her and Sarah for the day. We went shopping, and made pizza and brownies, and watched chick fliks and old episodes of the Gilmore Girls. It was excellent. My host family is out of town, so I spent a quiet evening cleaning up my room, and organizing my stuff, and other necessary things. It’s nice to have quite evenings to yourself sometimes :). Sunday morning was a lazy day. We had daylight savings, so I got an extra hour of sleep, which was nice. I slept in and still had time to get some homework done before church :). After church I went shopping for presents – there’s been a festival going on since I’ve been here, and this is the last weekend it will be around. I wanted to swing by before it closed. It’s so strange to think of it not being there tomorrow…it seems to kind of be a part of Seville by now. I also ran into a friend of mine, Rodrigo, and we hung out for a few hours. I got a rather backwards compliment from him that I’m quite proud of. I was talking about how different I am now than I was when I was younger, and he asked me, “What happened? Did Jesus change you?” It was quite apparent that that was not a serious question – Rodrigo makes no claims to be a Christian, and the sarcasm was so thick I could have cut it with a knife. But I chose to ignore it and simply answer the question. “Yes,” I said, “He did.” Then Rodrigo was like, “That’s what I like about you. Most of the time when I’m around hard-core Christians I try to say things to piss them off, and it usually works. But you never react when I try to insult you.” I’m almost positive that he did not intend that as a compliment, but the fact that A) he considers me to be obviously Christian and B) I don’t react to insults in a way that turns people off of Jesus made my heart swell. Monday was quite an excellent day. I went to Carmona, a small town about 40 kilometers from Seville, with Justo, per Jon’s suggestion. Actually, Jon’s homework said I had to take a bus, but everyone knows the cool people take cars ;). So Justo picked me up mid-morning, and we drove to Carmona. Can I just say that Justo is the best intercambio ever!! He had already been to Carmona, so he took me to his favorite haunts; he also brought along a map and tourist info, so we knew exactly what spots we should hit. Also, he printed out a history of the city from online, and made me read it aloud to him as we drove. He corrected my pronunciation when needed, and explained to me any words I did not know. He also tries to correct me during the course of normal conversation, something that I give him huge props for. I’ve been on the other side of the coin – I’ve been the fluent speaker talking to someone who’s learning the language, and I know that it’s really hard to correct them if they’re trying. As long as I understand what they’re trying to say, I tend to ignore the errors. But that’s not how to improve, and I’m so grateful that he actually tries so hard to help me get better. I need to hang out with him more often – I know my Spanish noticeably improves every time I do :). He also offered to correct my papers that I have to write for school. Besides that, we get along really well – he’s very easy-going and fun to be around, and also speaks very good English, so I can switch whenever my brain starts really hurting, lol. Alright, now that I have sufficiently extolled Justo’s commendable qualities, let’s continue with the story, shall we? 🙂 We walked around for a while, just drinking in the sights. There was a famous convent that we went and visited – this picture is from the top of the tower. I like it because you can see the city behind us through the slats in the window :). The sunset was absolutely gorgeous – although I did snap a photo of it, it truly doesn’t do it justice. But oh well, I did my best :). Whew, what a week! I’m super glad it’s over. This has without a doubt been the most hectic few days I’ve had since I’ve been here – hence my long silence on blog updates :). But I think things are finally calming down again, so I should be able to give you more frequent updates and pictures (on that note, it has come to my attention that the link to the pictures in Españoles por fin was broken. I have now fixed that). Anyway, I suppose first I should update you on my classes, since that is, after all, why I’m here. Last week I had finals (hence part of the reason for the insanity). There are 2 rounds of classes here: one lasts only 3 weeks, and the other lasts until the end of the semester. So last week I finished up my first term. I feel like it went well. My lowest grade up until that point was a 95, and I was the first one done with the test :). I’m sad it only lasted 3 weeks, though…I really liked the teacher. I also got my schedule for my future classes…and it’s INSANE! I hate it :(. But I’m going to talk to the director and try to change some classes around on Monday, so I’ll let you know my final schedule in my next update. I do believe, however, that I will have ALOT more free time, so hopefully you’ll be hearing from me more often (be that in blogs, chat, or skype :]). So, in other homework news: I opened my next letter from Jon last week. So here are my new assignments: 1) Take a dance class as part of the tour at the Museum of Flamenco Dance, 2) Take your new dance moves and dance in one of the fountains at Alameda de Hercules, 3) Find the ruins beneath the Plaza de Pescanderia, 4) Take a picture of something that makes you extremely happy, and post it on Facebook (check out my picture here. And, before people start teasing me about having a Spanish boyfriend, it´s not him specifically that makes me so happy, but just all of my Spanish friends in general :P. That´s just the only picture I have so far), 5) Sing your siblings a song over Skype webcam, and 6) If your wardrobe allows it, wear Spain’s colors one day. Interesting thing there, although Spain’s colors are red and yellow, yellow is considered bad luck. People rarely wear it, and performers never, EVER wear it. I find it ironic that the national color is considered bad luck… My wardrobe at the moment does not allow it, but I’ll see if I can fix that before I leave :). With less classes and not having to worry about my applications (I finally got them submitted, woohoo!!!! ), I should have a lot more time to get my bucket list done. I’m super excited about it, especially since I’ve started meeting people that I would want to share my experiences with. On that note, I went out Saturday night with Sarah and some intercambios, Miguel and Eligio. I had sooo much fun. Also, I’m such a nerd :D. We did go out late, which is normal in Spain…but what we did was not normal. We went to an arcade room that’s in the big mall in Seville (Nervion Plaza), and played arcade games all night. May I just say that I dominated at air hockey :D. Afterwards, we went to a bar that was owned by a friend of theirs, and bought drinks and just sat around and talked. I got a tea that’s very similar to a peach tea from Costa Rica, so I was happy. We talked about anything and everything, and laughed at each other’s language mistakes, and in general just had a grand time. I didn’t get back to the house until after 2:00, however, which made the next day rather hard to stay awake. There’s a reason I don’t stay out that late on school nights…the next day I’m totally shot :). But anyway, let me tell you about the next day!! Sarah had told me about an evangelical church she went to last week when I went on the hiking trip, and so this morning I went with her to church. It was amazingggggg. (although I don’t ever want to hear you guys complaining that your hour and a half long services ran long…this church meets from 11:30 – 2:30 :P) The worship was awesome, and the sermon excellent (especially since I understood all of it! Yes, it’s all in Spanish), and I got to meet some awesome people, too. I’m pretty psyched about going back. They’re starting a Bible study on Thursday nights that I want to get involved in…right now I have a class at the same time, but hopefully I’ll be able to change it. So after church I came home and ate lunch with my family, and then promptly passed out. I felt better after a nap, which is good, cuz I went out again with the same group from last night. We walked around the city for a while – didn’t really do anything, but it was fun, nevertheless. I’m so excited about Jon’s bucket list, though – I plan on showing these natives Sevillanos their city. Many of the things he’s having me do, they have never done before. So we’ll get to experience them together. I suppose it’s the same way in the USA – if you grow up around something, you’re less likely to appreciate its uniqueness. The people least likely to have been to the Grand Canyon always seem to be the ones that live within a hour of it :). Oh also, I forgot to mention that on Saturday I went to Aracena to see “Las Grutas Maravillosas” (the amazing caves). They truly were amazing. They didn’t let us take any pictures, which was quite tragic, but at least I have the memory of them. I love caves :D. Aracena is famous for it’s “jamón ibérica”, so I also went to a pig museum while there (yes, it really does exist), and tried some of the famous ham. It was good, but very very salty – the way they make it is smother it in salt and leave it to air-cure. Check out pictures here. After the museum, I went up to the top of the mountain to see the castle and church that was nestled in the top (which, of course, involved more climbing. If I don’t come back completely cured of my fear of heights, it certainly won’t be for lack of trying :]). So this weekend was quite excellent, overall. Probably the best I’ve had since I’ve been here. An ironically fitting ending to what was definitely the worst week so far. But everything has it’s season, and I’m quite glad that the season of stress was short. I have been slack in my homework for Jon. I now have 2 weeks’ worth of exploring to do. The second week’s assignments were: 1) Go feed the pigeons in la Plaza de America; 2) Go to Encarnación food market and buy something colorful to cook for dinner; and 3) Catch a movie at the historic Cine Cervantes with a newly aquired friend. I scouted out the Plaza, and found the hours of the food market, and looked up the shows playing at Cine Cervantes (as well as found a newly acquired friend to go with me), but I haven’t been able to actually do any of them yet. I had to open week number 3 today (Wednesday). I do believe that Jon thinks I’m superwoman or something – he gave me 3 sets of challenges to do, and they’re all longer than the lists last week!!! One list, however, is for Madrid, and one is for Dublin, neither of which I think I’m going to make it to, so I think I can manage 1 extra long list :). So, this week’s assignments are: 1) Go to the market in Plaza del Museo and look at all the beautiful artwork; 2) Take a bus to Italica, right outside of Seville. Make sure to visit the Museum of Archaeology or the Palacio de Lebrija; 3) get some ice cream at Rayas; 4) Work a line about the Spanish Inquisition into a conversation with a random person; 5) Convince a couple of friends to do the Macarena with you in a public area; and 6) Draw a picture on a napkin for your waiter at a restaurant you happen to visit. Speaking of cool things to do, what about this palace that I mentioned!! El Palacio de la Condesa de Lebrija is a 16th century palace-house that sits in the center of Seville. The woman who owned it was a passionate lover of Roman art, and also fabulously wealthy. She financed dozens of archeological digs to look for ancient artifacts – Roman, Greek, Arab, Persian, you name it – and put the results of those digs into her house. Even the floors are made of original tiles and mosaics from those time periods! So yesterday (Tuesday), I got to go on a tour of here house with a few of the other students. It was wicked cool. Check out the pictures here (they´re at the end of the album). The reason why I haven’t been able to go exploring like Jon would want me to is that I’m in the middle of the “intensive period” at school. We all have at least 2 classes; I have 3, because I’m also taking the flamenco class. One class meets every day for 4 hours a day, with daily homework, weekly tests, and more than weekly writing assignments. The other 2 classes add an additional 3 hours of classes a week, and 1 class (Cultural Realities of Spain) also has a weekly journal, writing assignments, and news articles that we have to find a comment on in class for homework. Geez, I just realized that I have 23 hours of class a week!! I guess I hadn’t really thought about it before now….no wonder I’m so tired! On top of all of that, I have applications to 3 different graduate programs due by the end of the month that I’ve been trying to finish. So, needless to say, I’ve been staying pretty busy. But anyway, I said all that just to mention that I got several grades back today – my first test, my first writing assignment, my participation grade for the first have of the grammar class, and my first week’s diary from my Culture class. I was quite excited that I had gotten an A in all of them! I got a 92 on the diary, a 93 on the writing assignment, and a 95 on the test and participation grade! My teacher wrote as a sidenote when she gave me my participation grade, “I’m delighted with your work in class. You are a serious and responsible student, and that is reflected in your work. Excellent participation.” It’s nice to see my hard work pay off :). My grammar teacher also gave me a point back because she had marked off a word that she shouldn’t have. Apparently it’s a real word, she just didn’t know it…as my dad would say, I read too much. My vocabulary’s going to get me in trouble one of these days :D. But anyway, I only have 1 more week of the intensive period, and then I’ll settle into my schedule for the rest of the semester. I’ll have more classes then, but they will be much shorter than the one I’m taking now, so hopefully I’ll have more time. Plus, I won’t have classes most Fridays. I’m excited about that. Apparently I am doing a good job fitting in here – it must be the fancy Spanish sandals I bought last week :). I have been asked 3 times in the past week for directions – all in Spanish. The first time I couldn’t help, because I had no idea where I was…the second time he just wanted to know where the Park of Maris Luisa was (thanks, Jon! )…and the third time I was actually able to give pretty detailed directions! I was doubly excited about that – it showed that both my Spanish and my knowledge of the city is improving. Well, Sunday I went to Mass and explored, as planned. My Señora told me that there were services in “La Catedral”, the huge old cathedral that I pass on my way to school every day, so I went there. It turns out that La Catedral does NOT have services; it’s more of a tourist attraction. So I took lots of pictures – it’s absolutely incredible – and went exploring. I’ll try to catch a service again next week. It makes it a little more difficult to do when the people I live with haven’t been to a church service in years – they can’t tell me what time the services start. Anyway, after I left the church I stopped at a cafecita (a little café) to buy a drink and use the internet a little bit. I heard some girls next to me speaking English, so after I finished what I was doing I walked over and introduced myself to them. We talked for quite a while – they were really sweet. They’re also American students studying abroad, but they’re studying at the University of Seville, instead of CC-CS, like I am. Only one of them, Grace, had a phone, but I got her number, and I’m sure we’re going to hang out again soon. After I left there, I went walking for a while. I found the park that Jon sent me to – apparently it’s one of the biggest in the city. But as soon as I got there, my camera died, so I couldn’t get photographic evidence. I was rather sad about that :(. But it’s pretty close to my house, so I’ll just go back again later :). It’s quite a lovely park – it has old buildings, and running trails, and little cafes, and fountains, and everything. Of course, almost everything in Sevilla is “quite lovely”, lol…. Monday, the first day of classes, was a whirlwind of activity. I wasn’t really organized yet, and the whole day seemed to pass in a blur. I currently only have 3 classes – advanced Spanish grammar, Spanish culture, and Flamenco dancing. My schedule will change after September. Dance is 2 days a week, and culture is only 1 day; but grammar is 5 days a week for 4 hours. My head is drowning in grammar :(. Anyway, Monday I had grammar and dance. I have decided that I did not, in the past, give flamenco dancers enough credit. I always thought that what they did seemed pretty easy. Trust me, it is not. But the teacher is super sweet, and I think I’m going to really enjoy the class. West Coast Swing would be better but hey, I’ll take what I can get :). We went on a bus tour of the city Monday night. I sat next to a really sweet girl named Sarah on the bus. She lives near me, and we’re going to be roommates on the group trip to Portugal this weekend. I really like her :). After the tour ended, myself and two other students, Nick and Sylvia, went to a big plaza and bought ice cream. I had dulce de leche, yummmm :D.